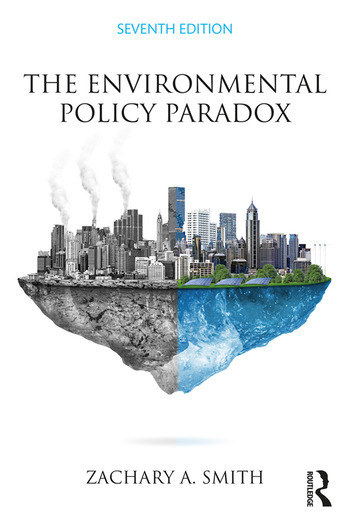 Updated in its seventh edition, The Environmental Policy Paradox provides an introduction to the policy-making process in the United States with regard to air, water, land use, agriculture, energy, and waste disposal, while introducing readers to both global and international environmental issues and institutions. The text explains why some environmental ideas shape policy while others do not, and illustrates that even when the best short- and long-term solutions to environmental problems are identified, the task of implementing these solutions is often left undone or is completed too late. Readers are presented with a comprehensive history of the environmental movement paired with the most up-to-date account of environmental policy available today. Covers new topics including fracking, Arctic drilling, the Keystone XL pipeline controversy, GMOs, food security, and the green economy. Provides expanded information about the subsidy process. Extends the treatment of land preservation with a discussion of the Land and Water Conservation Fund. Adds Discussion Questions to the end of each chapter. Zachary A. Smith is Regents’ Professor of Environmental and Natural Resources Policy and Administration in the Department of Politics and International Affairs at Northern Arizona University. The extensively updated new edition of Zachary Smith’s environmental policy textbook is remarkable. Using an overarching theme, paradox, Smith skillfully ties together the whole narrative, from the "big picture" of the eco-system and social-dominant paradigm, to an introduction to the environmental policy process and its institutional framework, and substantive policy chapters covering everything from air pollution to international environmental management. The new discussion questions will prove popular with introductory students. The new edition of Zachary Smith’s The Environmental Policy Paradox is a masterful compilation of social, economic, legal, and political matters pertaining to environmental policy: important statutes and policies, movement history, deliberations on current issues like the Keystone XL pipeline and the Paris agreement, and more local issues like land use management. Reading this book, students have the perfect blend of environmental law, policy, politics, and history. They will be well-served to pursue a degree or career in environmental policy, law, or politics. This text has served as the anchor for all my environmental policy courses for many years now: Zachary Smith’s use of the idea of paradox is particularly effective when examining environmental policy and politics. The text serves as a solid foundation for examining environmental theory and the policy process both in the U.S. and around the world. I rely on Zachary Smith’s The Environmental Policy Paradox for my course, and have done so for nearly fifteen years: It lays down the key concepts necessary to begin any conversation about environmental politics. The text is extraordinarily well-written and clear, the lessons are cogent, and each issue is given expert treatment from one of the most important environmental authorities living today. The new edition does not disappoint. The world of environmental policy-making is extremely complex, and students are often stunned by that complexity. In this new edition, Zachary Smith admirably renders the subject much easier to understand, and his questions at the end of each chapter help students navigate their own values and apply their issue-based knowledge. His capstone discussion, on whether democracy effectively deals with environmental problems, is perhaps the most important and evocative question of them all. Zachary Smith's concise and insightful analysis of environmental policy covers a lot of ground in this new edition, but does so in a way that is enlightening and informative, providing the reader with a balanced and nuanced understanding of the environmental challenges we face today.